A trip around the Golden Ring this time of year is not only a great way to get a better sense of the culture and history of ancient Russia—as well as idyllic shots of wintry onion domes—its also an opportunity to buy great gifts to give as Christmas presents when you return back home. Visitors from America and Western Europe might be surprised to discover that Russia celebrates Christmas on January 7th. That’s because the Russian Orthodox Church follows the Julian calendar. After the end of the Soviet Union, some Russians have begun celebrating Christmas on December 25 in accordance with the Gregorian calendar. But many Russians still observe the tradition of fasting on January 6th, breaking the fast with a large feast on Christmas Eve after the first star has appeared in the sky. During the Soviet era, Christmas and religious traditions were banned in Russia. Santa Claus was replaced by Ded Moroz, or, Grandfather Frost, an old man with a long white beard who would bring gifts to children on New Year’s instead of Christmas. According to Russian tradition, Ded Moroz is accompanied by his granddaughter, Snegurochka, the Snowmaiden, who helps him on his journey to give presents to children. 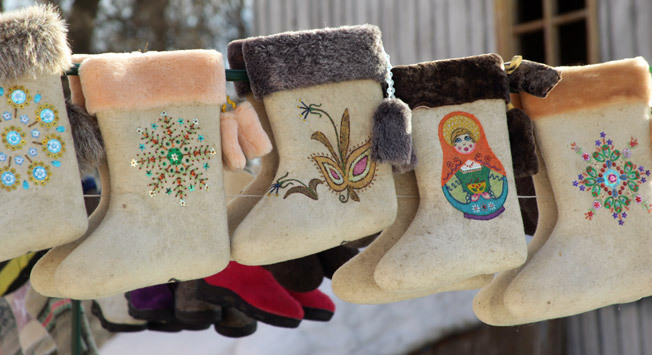 Although the tradition of having a Christmas tree, known as a yolka in Russian, was also banned during Soviet times, Russians got around this by having New Year’s trees from which they hung homemade decorations. Today, the restrictions of the Soviet Union have faded into history, and during the Christmas season visitors to Russia can even purchase Christmas ornaments in the shape of matryoshka dolls, or religious icons that depict nativity scenes. Heading counterclockwise around the Golden Ring this holiday season, northeast of Moscow, your first stop will most likely be the city of Vladimir, home to some of Russia’s most striking churches and cathedrals. The Vladimir region is known for its fine crystal. Stop by the Crystal, Lacquer Miniatures, and Embroidery Museum ( 2 Bolshaya Moskovskaya ) for an overview of traditional crafts before visiting the gift shop in the museum to browse the crystal selection. Vladimir Chic ( 2 Dvoryanskaya ) also sells local glass and crystal work. Typical souvenirs are also for sale in Vladimir’s old town, especially by the Golden Gate, a triumphal arch and defensive tower that is one of the last-remaining parts of the wall that once surrounded ancient Vladimir and a sure stop on any tour of the Golden Ring. Just 63 kilometers from Vladimir lays the nearby city of Gus-Khrustalny , the ‘Crystal Goose,’ also home to a rich glass and crystal making tradition. You can visit the glassmaking factory in Gus-Khrustalny and buy gifts ranging from plates and vases to decanters, or visit the outlet store back in Moscow ( 4 Ilyinka ) just east of the Kremlin. North of Vladimir, you’ll arrive in Suzdal, one of the Golden Ring route’s more tranquil towns. Suzdal boasts a number of small bazaars and stands outside the main tourist sites where visitors can purchase local honey mead, called medovukha, along with traditional crafts, like a pair valenki, or Russian woolen boots, which make an ideal Christmas gift for friends and family back home. The shopping stands outside Suzdal’s Museum of Wooden Architecture and Peasant Life ( Ul. Pushkarskaya ) are also highly recommended. Market Square ( Torgovaya Pl ) houses a number of shops where visitors can search for arts and crafts. Following the Golden Ring north of Suzdal, many tours will stop in the city of Kostroma, a former trading outpost on the immense Volga River. One of the city’s highlights is the Museum of Linen and Birchbark ( 38 Tereshkova ), where visitors can view exhibits on traditional Russian crafts woven from flax and bark. A gift shop in the basement sells tablecloths, napkins, baskets, linen dolls, and traditional clothing typical of the region. South from Kostroma, stop in the city of Rostov-Veliky for enamel jewelry, a craft which allows artists to produce small paintings on metal that are then fired to produce a thin glaze over the image. Rostov became famous for its tradition of enamel work. Today, visitors can purchase rings, earrings, bracelets, brooches, and jewelry boxes in the gift shop of the Rostov Enamel factory ( 3 Borisoglebskoye Highway ). While you’re in Rostov, visit the House of Crafts ( 16 Vtoraya Tolstovskaya Naberezhnaya ) for local pottery and the Souvenirs shop ( 5 Ul. Kamennyi Most ) for ushanka hats—Russian fur caps with earflaps—paintings, and samovars for tea lovers. The last two stops on a tour of the Golden Ring are the cities of Pereslavl-Zalesskiy and Sergiev Posad. Pereslavl is most famous for its embroidery work, available at the Art Salon ( 12 Ul. Sovetskaya ) along with souvenirs made of wood and stone. Nearby Sergiev Posad is considered the place where Russia’s matryoshka dolls were first invented, and was the chief production center of the dolls before Soviet times. Visit the city’s Toy Museum ( 123 Pr. Krasny Armii ) to get a better sense of the birthplace of one of Russia’s most recognizable toys, then head over to the market alongside the Trinity Monastery of St. Sergius—one of the city’s most important sites—to load up on matryoshka dolls, painted eggs, and icons before going home. If you’ll be in the Golden Ring during New Years, the city of Vladimir hosts an impressive Christmas fair, with an iceskating rink and performances by local artists, in the main square ( Sobornaya Pl ). In most other Golden Ring cities you’ll find similar events in the center square as Christmas nears. Most shops and markets in the Golden Ring are open year round. If you’re coming to Russia for a short period of time, whether in winter or summer, consider a trip to this stunning part of the country, and bring an extra bag if you plan to go shopping for Christmas gifts.